Formentera manages beach security through a Municipal Service with direct management without the support of any private enterprise. This determines the uniqueness of the service throughout the Balearic Islands archipelago. Separately, the Service has an inflatable boat to monitor support all the coasts of the island. 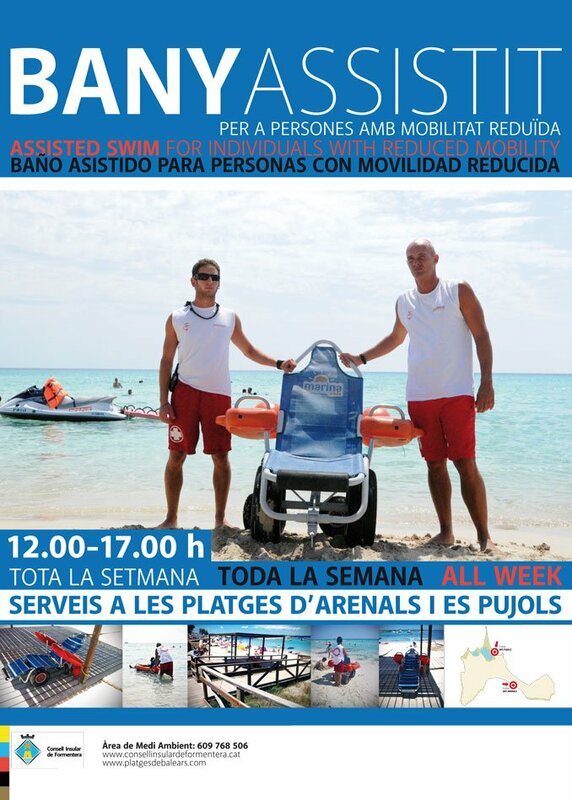 The Lifeguard and Rescue Services of the Formentera Island Council wish to inform you that we have at the disposition of the public certain assisted swim features (amphibious chairs) at the following beaches: Es Arenals at Km 11, next to Es Arenals restaurant, and, in Es Pujols, in front of Sa Palmera restaurant. The service is available between 12 noon and 5:00 pm all week long, only when conditions are at the green flag level. The assisted swim service consists in the use of an amphibious chair – waterproof and to be used with the specialised help of a lifeguard. Beach conditions can also be consulted at any time on the www.platgesdebalears.com website or in the Offices of Tourism. The different colour flags of the different beaches with lifeguard service are updated on the website, and other updates – about water currents, etc. – are also posted. For more information on this subject and for other info related to the Lifeguard and Rescue Services of the Formentera Office of the Environment, we can be reached at 609 768 506.